Sentrifugo 2.1 is packed with a lot of new and improved features which have simplified the workflow in Sentrifugo. Configure and manage Sentrifugo’s full-featured flexible solutions that are unique to your organization. Sentrifugo's Time module consists of a simple and effective way to enter time, track employees' activities, time offs and generate accurate time reports. Managers can easily configure the company's projects, client information and task details. 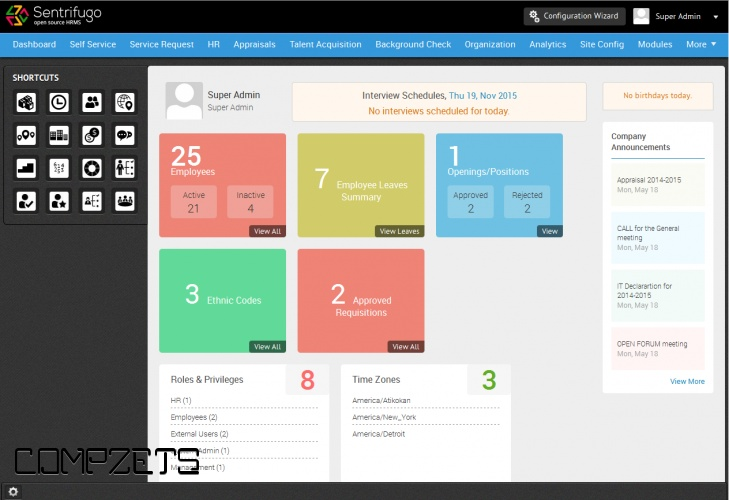 They can add employees to the projects with client details and assign tasks to them. They can view the timesheets of the employees reporting to them in a daily, weekly or monthly view format. #Employees can enter the hours spent on an assigned project. Employee and project time reports can be generated based on the details entered by the employees. We have added a few more steps to our Configuration Wizard (Super Admin) which will guide you to easily set up the application. A separate Configuration Wizard for the HR. Leave allocation for multiple employees at once. Managers can now view the employees' (reporting to them) leaves on his calendar. This feature enables you to access & store all your organisation's policy documents. Your employees will now have access to view essential documents such as employee handbook, leave policy etc. in just one click. The Super Admin, Management & #HR can create different categories for the policy documents and place them accordingly. Documents can uploaded one at a time or multiple documents at one go. A few cumbersome steps and settings have been improved, modified or removed. For users who already have Sentrifugo, can download the patch release which will be available on our website.